Parablepsis is what happens when a copyist’s line of sight drifts from one word or set of letters in his master-copy to the same (or similar) word or set of letters a little further along in his master-copy, accidentally skipping the words or letters in between. When manuscripts share arrays of short readings that look like they were caused by parablepsis, it’s reasonable to posit a relationship of some sort between the manuscripts with those short readings. Before looking into that further, let’s take a look at four examples of parablepsis that appear in the Gospel of Matthew in one of the most important manuscripts we have: Codex Sinaiticus. ● Matthew 7:27 – In the description of the fall of the house of the foolish builder, the scribe’s line of sight drifted from ποταμοὶ καὶ to ἄνεμοι καὶ, accidentally losing the phrase about the blowing winds. The scribe of minuscule 579 made the same mistake in verse 25. Another Alexandrian manuscript’s scribe made a worse mistake: the scribe of minuscule 33 skipped from the words τη οικία ἐκείνη (“that house”) in verse 25 to to the same words in verse 27, skipping verse 26 entirely and producing a Greek sentence which says that when storms came to the wise man’s house, it fell with a great crash! ● Matthew 21:19 – The scribe of À did not write the word ευρεν (“found”) between the word ουδεν and the word εν. The omission could have been elicited by either homoioteleuton (“same endings” or by homeoarcton (“same beginnings”). As far as I know, Codex Sinaiticus is the only manuscript that has all four of these readings. If we were to find another manuscript, and all we knew about it was that it contained these three exact readings, I would strongly suspect that it was extremely closely related to Codex Sinaiticus. As Kirsopp Lake wrote, “Whereas agreement in a correct reading is no criterion of similarity of origin, agreement in erroneous readings is a very good criterion.” The odds seem extremely low that two copyists would make the same series of parableptic errors. The thing to see is that by observing readings in manuscripts that can be accounted for by parablepsis, we can deduce that the manuscripts that share those readings are related to one another. Consider Matthew 12:47: this verse is not in the English Standard Version, because the editors of the ESV relied so heavily on the Alexandrian Text. But the absence of this verse is elegantly accounted for as a parableptic error; an early copyist’s line of sight jumped from the word λαλησαι (“to speak”) at the end of verse 46 to the same word at the end of verse 47, losing the words in between, which constitute verse 47. Are the manuscripts that lack verse 47 closely related? 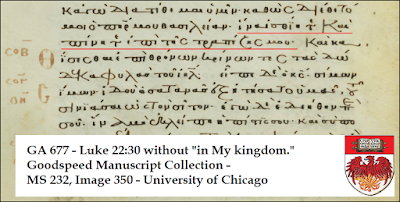 While there are a smattering of unrelated manuscripts that do not include this verse, the major Greek manuscripts for non-inclusion are Sinaiticus, Vaticanus, Codex L, and Codex Γ, and although Codex Γ’s text is Byzantine, the other three are flagship manuscripts of the Alexandrian Text. 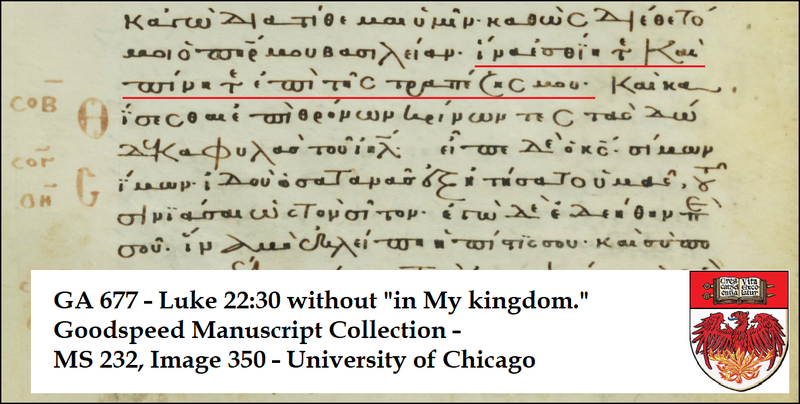 Even Codex Γ reveals the influence of Alexandrian manuscripts in its ancestry; it includes a rare interpolation in Matthew 27:49 that is also attested by À, B, and L. (For more about Mt. 12:47, see this post.) The ESV really should put this verse back in the text where it belongs. Now let’s aim this principle at some readings in the Byzantine Text that are shorter than their rival readings in the Alexandrian Text. There are hundreds of such readings; here I will briefly focus on just 20 – five from each Gospel. ● Matthew 10:8 – If the text originally read Ασθενουντας θεραπεύετε νεκρους εγείρετε λεπρους καθαρίζετε (Heal the sick, raise the dead, cleanse lepers), the shorter Byzantine reading can be accounted for by a parableptic error from -ετε to -ετε. ● Matthew 13:40 – If the text originally read κατακαίεται, an accidental skip from κα- to κα- would account for the Byzantine reading. ● Matthew 19:24 – If the text originally read πλούσιον εισελθειν εις την βασιλείαν του θεου, a parableptic error from εισ- to εις could elicit the loss of the intervening letters, eliciting further the movement of εισελθειν to the end of the verse. ● Matthew 24:38 – If the text originally read εν ταις ημέραις εκείναις, an accidental skip from –αις to –αις could result in the loss of the word εκείναις. ● Matthew 27:40 – If the text originally read και κατάβηθι, an accidental skip from κα- to κα- could result in the loss of the word και. ● Mark 2:21 – If the text originally read απ’ αυτου, an accidental skip from α- to α- could result in the loss of απ’. ● Mark 3:28 – If the text originally read και αι, an accidental skip from -αι to αι could result in the loss of αι. ● Mark 4:18 –If the text originally read ουτοί εισιν οι τον, an accidental skip from ο- to ο- could result in the loss of ουτοί εισιν. ● Mark 12:8 – If the text originally read εξέβαλον αυτον, an accidental skip from -ον to ον could result in the loss of αυτον. ● Mark 14:21 – If the text originally read Οτι ὁ μεν, an accidental skip from Ο- to ὁ could result in the loss of Οτι. ● Luke 11:20 – If the text originally read εγω εκβαλλω, an accidental skip from ε- to ε- could result in the loss of εγω. ● Luke 19:4 – If the text originally read εις το εμπροσθεν, an accidental skip from ε- to ε- could result in the loss of εις το. ● Luke 20:19 – If the text originally read εφοβήθησαν τον λαόν, an accidental skip from -ν to –ν could result in the loss of τον λαόν. ● Luke 22:18 – If the text originally read απο του νυν απο, an accidental skip from απο to απο could result in the loss of απο του νυν. -ν to -ν could result in the loss of προς αυτον. ● John 1:50 – If the text originally read οτι ειπόν σοι, οτι ειδον, an accidental skip from -ι to -ι could result in the loss of οτι. ● John 4:3 – If the text originally read και απηλθεν παλιν εις την Γαλιλαίαν, an accidental skip from -ν to –ν could result in the loss of παλιν. ● John 11:30 – If the text originally read αλλ’ ην ετι εν τω τόπω, an accidental skip from ε- to ε- could result in the loss of ετι. ● John 21:21 – If the text originally read Τουτον ουν ιδων ο Πέτρος, an accidental skip from -ν to -ν could result in the loss of ουν. There are many more textual contests in the New Testament in which (a) the Byzantine Text has a reading that is shorter than its rival Alexandrian reading, and (b) the shorter reading can be accounted for as a result of parablepsis. For example, in the Byzantine Text, James 4:12 does not have the words και κριτής (“and Judge”), a short reading which can be explained if the verse originally began with Εις εστιν νομοθέτης και κριτης and an accidental skip was made from the -της at the end of νομοθέτης to the -της at the end of κριτης. (1) If is acknowledged that, say, half of these short Byzantine readings are the result of parablepsis, then unless we assume that scribes independently made the same mistake at the same point in the text ten times – which seems highly improbable – then they must echo an earlier ancestor-manuscript in which the text of these passages had been shortened via parableptic error. (2) Textual critics should use manuscript-evidence that represents different text-types, not just the Byzantine Text. This is the only way to detect (and remedy) parableptic errors in which some text was lost but a sensible sentence was formed nevertheless. It appears that most Byzantine Gospels-manuscripts are descended from a master-copy or master-copies in which some small snippets of the text have been lost via parablepsis. It also appears, from other research, that most Alexandrian Gospels-manuscripts are descended from a master-copy or master-copies in which much more text has been lost via parablepsis. To depend too heavily on one form of the text, merely because its oldest representatives lasted longer in Egypt’s low-humidity climate, or upon another form of the text, because it has circulated in a much higher number of manuscripts, is not our best option. kai esmen (and we are) in 1 John 3:1 is another one. Thanks for Englishing so much of the discussion!